We’ve been saying it all along, but it turns out print wasn’t dead after all but merely evolving. Following the introduction of GDPR last year and with digital marketing reaching saturation point, at Something Big we’re seeing a print renaissance. Print is effective, and unlike digital communications that can be fleeting, ignored and potentially untrusted, print is often looked at and trusted. The longevity and tactile shareability or print is undisputed. But with the environmental impact of everything we produce being more pressing than ever, is it possible to communicate by print while protecting the planet? The answer is yes, just like all marketing channels, print techniques have been constantly evolving and now there are lots of eco-friendly options. Is switching to recycled paper better for the environment? Not necessarily. It’s a common misconception that recycled paper is ‘eco-friendly’ but to recycling the fibres and making them suitable for printing again is not an environmentally friendly process. The materials can only be recycled a limited number of times, so recycling paper alone is not a sustainable long-term solution. Unbleached papers are available, that can give print a ‘natural’ feel, but they don’t produce great results when printing high quality images. The decline in recycled papers has been so great in recent years that many paper merchants now only produce a few recycled papers, whilst others have completely discontinued them. What’s the alternative to recycled paper? Sustainability is always a good solution and you can source your papers from certified sustainable sources, such as FSC or PEFC certified forests. This ensures your papers are responsibly sourced from well managed forests, and that the wildlife and people that inhabit those forests are also protected. These accreditations ensure that high standards are protected by a Chain of Custody Certification, so that the paper can be traced from the end user right back to the source. The FSC or PEFC logos and certificate codes can be printed onto your products to give customers added assurance. I want to have a laminate on my print, does this mean it’s no longer environmentally friendly? Not necessarily! There are a biodegradable and recyclable options out there, such a biodegradable laminating film. I currently use a plastic film envelope for mailing, is there an alternative? Yes, and it’s made from potato starch! Potato starch wrapping is becoming increasingly common, with the National Trust using it this year to send out all of their 2019 materials. The wrapper can even be used as a liner for food waste caddies. Products such as Polycomp™ are fully compostable, potentially within as little as 10 days, and still offer good protection during mailing. Most UK families throw away about 40kg of plastic per year, so making just small changes can have a big impact. Alternatively, a paper wrap can still offer a greener and recyclable solution to traditional polythene film. What else can I do to show that I’m thinking about the environment? You can also work with Carbon Balanced Printers. This simply means that the printers calculate the carbon footprint each job produces and offset it elsewhere. They do this by donating a portion of their profits to organisations like The World Land Trust who balance the emissions by preserving 41,000 square meters of conservation land. FSC and Carbon Balanced logos can be added to the artwork so you can shout about how committed to the environment you are. Whilst we are rightly becoming more conscious and concerned about the environment, that doesn’t mean we have stop using an effective marketing channel, we just have to be smarter about how we do it! 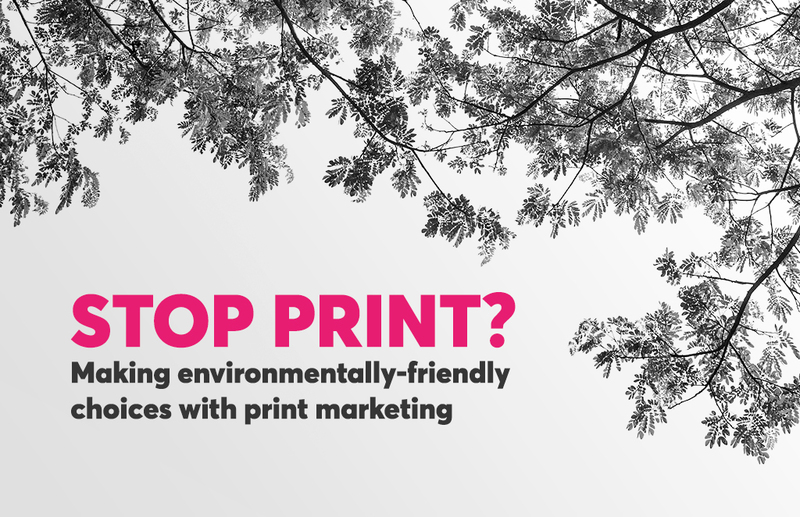 To find out more about how your business could use environmentally friendly print marketing to stand out from the crowd, get in touch.